Published: Nov. 4, 2018 at 05:20 p.m. Published: Oct. 28, 2018 at 03:37 p.m. Published: Oct. 30, 2017 at 10:49 p.m.
Denver Broncos running back Devontae Booker runs through hole into the end zone for a touchdown. 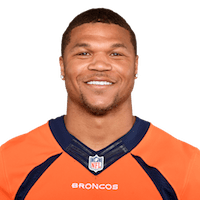 Published: Oct. 30, 2017 at 10:31 p.m.
Denver Broncos quarterback Trevor Siemian's audible helps set up huge run for running back Devontae Booker.